As of July 31, 2018, Hurricane Katrina in 2005 had the highest amount in NFIP payouts, at $16.3 billion. Hurricane Harvey of 2017 ranked second with $8.8 billion in NFIP payouts. Superstorm Sandy, which occurred in October 2012, ranked third, resulting in $8.8 billion in NFIP payouts. Hurricane Irma, also in 2017, ranked ninth with $1 billion in payouts. 2017 data are still preliminary. The figures above are preliminary, as claims are still being processed, and do not include payouts from Hurricane Florence in September 2018 or Hurricane Michael in October. As of July 2018, 69% of policies covered single family homes, 20% covered condominiums and 5% covered businesses and other non-residential properties. Two- to four-family units and other residential policies accounted for the remainder. At the end of 2017, the Federal Emergency Management Agency (FEMA) said that the 2017 extremely active hurricane season season spawned 17 named storms, of which 10 became hurricanes. Six of those hurricanes were classified as major storms – category 3 and above. Two major hurricanes were the first to hit the continental United States in 12 years – Harvey and Irma. In addition, Maria devastated Puerto Rico. 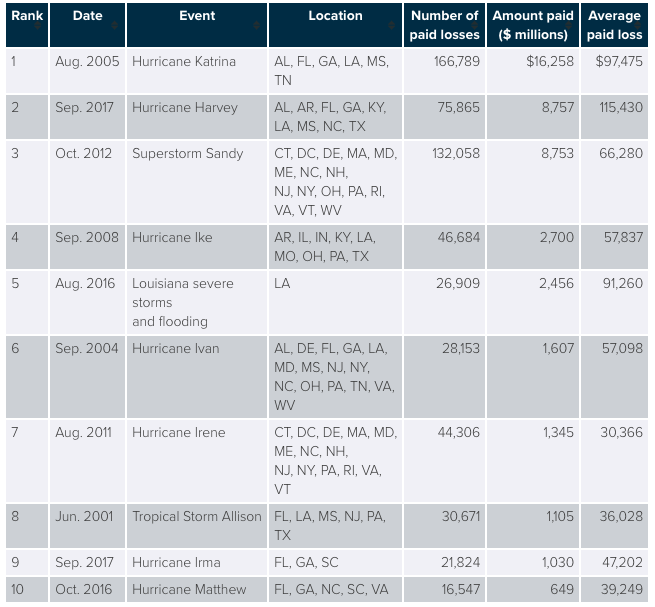 The NFIP paid out over $8 billion in flood insurance claims from those storms and other floods to date. 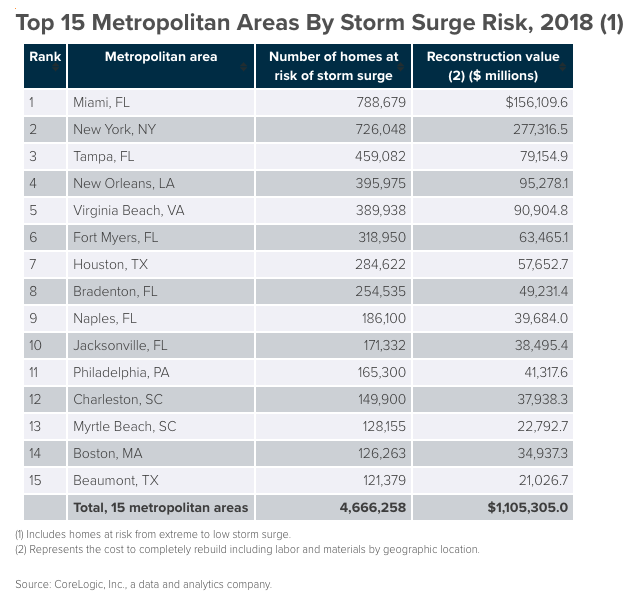 About 6.9 million coastal homes along the Gulf and Atlantic coasts, worth more than $1.6 trillion, are at risk for storm surge damage, according to a CoreLogic report.